BOAT STUDY PLANS ... Delivered by DOWNLOAD to your computer plus we will send you a USB Memory stick with many extra drawings and photos. The study plans have lists of materials & equipment etc & these will be useful in costing out the complete boat. ists of materials - Technical information - Numerous construction drawings are all included. You can view & print the drawings in full or in sections. BUILDING PHOTOS are included in the study plan package. PLUS you receive a FREE (value 79.95) e-book BUILD YOUR OWN BOAT. STUDY PLANS ROBERTS 246 + ROBERTS 25 ..
Each plan contains all the construction drawings for FIBERGLASS OR WOOD EPOXY construction, plus bonus drawings covering electrical, plumbing and engineering. Plus you will receive a DETAIL FOLIO showing how to make many of your own boat fittings, lists of materials and equipment, all technical information, numerous construction drawings and written building instructions are all included. This sailboat has been very popular and has proved to be an exciting boat to sail. The drop keel version could quite easily be made trailerable. boat plans are available in either Wood Epoxy or fibreglass construction. L.O.A. 7.4 m 24' 3"
L.W.L. 6.3 m 20' 8"
BEAM 2.5 m 8' 2"
DRAFT.....fixed keel 1.20 cm 3' 9"
DRAFT......lift keel Max 1.46 cm 4' 3"
Min 0.5 m 1' 7"
The rig is designed to achieve the maximum performance of this lively sailboat that is ideal as either a family cruiser or for Club racing where it will do well against any similar sized boat. On the left is shown the drop keel version which is combined with the lifting rudder to allow you access to areas where the water is a bit thin ! There are two fixed keel options - either the medium draft or the deeper ultimate performance keel may suit you best. 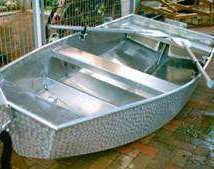 The trailer boat plans are supplied with the complete boat plans and full size patterns. The Roberts 246 sails a well as it looks ! This boat has a spacious interior and full standing headroom throughout. 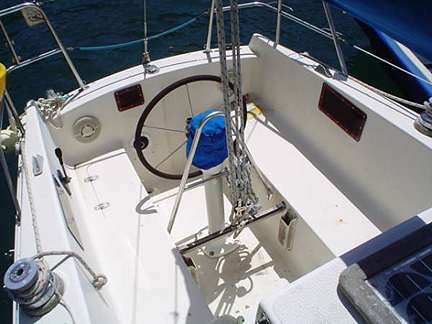 The cockpit is similar in all the versions of this very popular cruising trailerable sailboat. The photo is taken from a Roberts 25 which also has a similar arrangement. 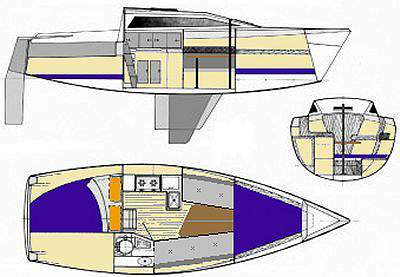 This illustration shows the male hull mold covered with either thin inexpensive plywood or hard-board followed by the inner fiberglass laminate, next either foam or balsa core and finally the outer layers of fiberglass. Note the area of the keel is not cored but has additional fiberglass laminate to provide maximum strength in this area. Here we see the construction of the deck and cabin male mold which consists of deck and cabin top frames and battens covered with either thin inexpensive plywood or hard-board followed by the inner fiberglass laminate, either foam or balsa core is then installed and finally the outer layers of fiberglass are laminated in place. FREE with every set of boat plans and frame patterns you will receive boat plans and full size patterns for the Roberts Dinghy that you can build in fiberglass, plywood or aluminum as shown below.